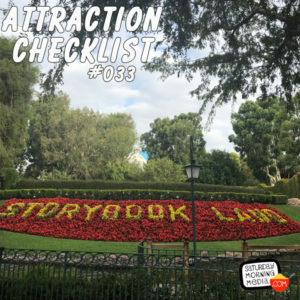 http://www.attractionchecklist.com – This episode we experience an attraction that has been around from opening day at Disneyland, the Storybook Land Canal Boats. Joining the fun, for his very first ride on this attraction, is John B. deHaas. After we ride, we discuss our thoughts on this ride that has stood the test of time. Recorded on June 21, 2016. Photo by Jeff Peterson. Let’s take a trip to Disneyland’s Fantasyland and enjoy a leisurely cruise on the Storybook Land Canal Boats. The Disneyland website describes this attraction by saying, “Cast off on a colorful canal boat for a “mini” tour of fairytale destinations seen in classic Disney animated movies.” There are no height restrictions for this attraction and the thrill level describes the attraction as being a slow ride and a water ride. Before we set sail, here are five fast facts about Disneyland’s Storybook Land Canal Boats. 1. The Storybook Land Canal Boats is a Disneyland, opening day attraction. Although when the attraction opened on July 17, 1955, it lacked the landscaping and miniature houses it is known for today. After only two months of operation, the attraction was closed and when it reopened in June of 1956 the landscaping and miniature houses had been added. 2. The lighthouse at the entrance to the queue line is the former ticket booth from when Disneyland guests needed tickets to ride the attractions. In those days, the Storybook Land Canal boats were a D ticket attraction. 3. The attraction’s fleet of electric inboard motor powered boats are each named after a Disney character including Alice, Belle, Merryweather and Wendy. 4. As you will hear, guests on the attraction sail past miniature replicas of locations from Disney animated films including the houses of the Three little pigs, The Dwarves Cottage from Snow White and Cinderella’s Castle. Over the years, miniature buildings from newer Disney animated films have been added to the attraction. in 1994, the Sultan’s Palace from Aladdin was added and in 2014, several buildings form the movie Frozen were added. 5. The doors of many of the buildings guests see on this attraction actually open and close. Not only does this add to the realism, it allows Disneyland employees to change and light bulbs that burn out inside the buildings. Let us now set sail on our cruise of Storybook land. Along for the ride is John B. deHaas who will be experiencing the attraction for the first time. You’ll hear his thoughts on this Disneyland Classic as well as mine after the ride audio. This is a binaural recording, so if you have headphones, put them on now as we experience Disneyland’s Storybook Land Canal Boats.